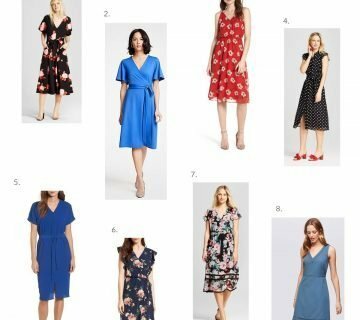 Tired of seeing Nordstrom Anniversary Sale-related blog posts?! I know, I know. I’m right there with ya. I know this sale is a huge deal and all, but I also think that everyone needs to calm down. It is just shopping that we’re talking about! But alas, here I am jumping on the bandwagon to talk about a few of my favorite purchases. All of you know by now that I shop on a pretty strict budget, so you won’t find any designer deals or duds in this post. 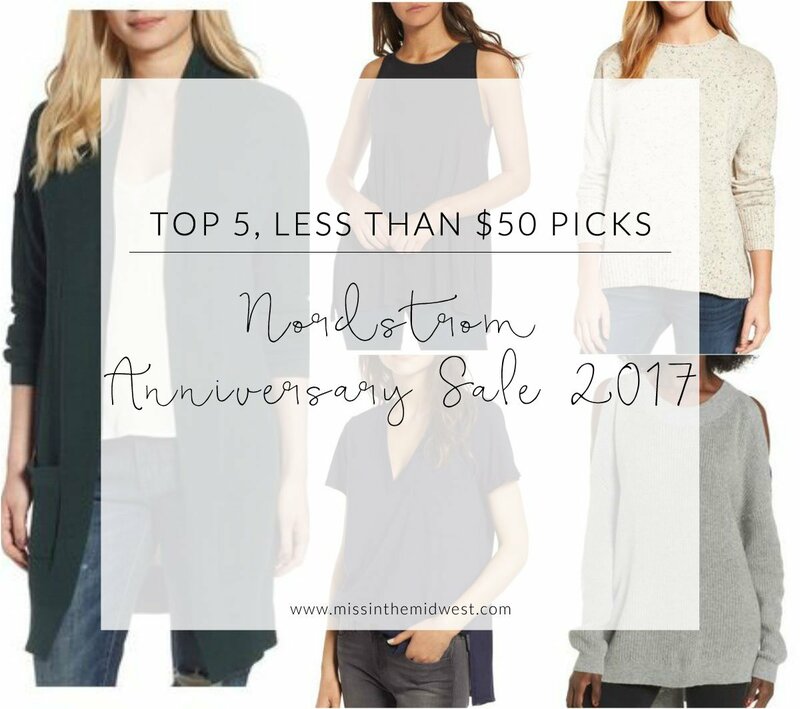 Here are my top 5 Nordstrom Anniversary Sale picks for less than $50. | BP. LIGHTWEIGHT RIB STITCH CARDIGAN. (Size: S. Colors: Black, Green Hunter & Beige Oatmeal). This cardigan is a no-brainer. I have it in grey from the sale last year, and I wear it with practically everything. This style looks slightly different from last year, but it’s close enough. I actually hope it’s not as thick/chunky as the older style. | LUSH SIDE SLIT TANK. (Size: S. Colors: Black & Dusty Rose). I’ve heard nothing but rave reviews about this tank. It looks like a great layering piece. I’m never sure about Lush sizing, but I went with a small since I don’t want layering tanks too baggy. | BP. COLD SHOULDER TUNIC SWEATER. (Size: S. Color: Grey). Doesn’t this look so cozy? Depending on how it turns out in person, I already can imagine wearing this on all those cold days that inevitably are in our future. | CASLON BACK ZIP PULLOVER. (Size: S. Color: Beige). Love at first sight! I’m probably most excited for this sweater. It’s classic, but the exposed zipper in the back keeps it interesting. | LUSH RAW EDGE SIDE SLIT TEE. I haven’t actually purchased this (yet), but everyone else seems to be! This looks like a way better version than the Lush tee in last year’s sale. It comes in a ton of colors, and you can’t beat $16 for a quality tee. How do these fit? Large? Small? I’d love to know! Let’s also give honorable mentions to the Lush High Neck Knit Midi Dress (love this in navy); Leith Ballet Crop Wide Leg Ponte Jumpsuit; and Topshop Patchwork Marled Cardigan (only a few bucks more than $50). There you go, shoppers – my top 5 Nordstrom Anniversary Sale picks for less than $50. I’m not sure that I’ll do a follow-up post once all my goodies arrive. Let’s face it – everyone is going to do try-on hauls – so maybe I’ll do something over on Instagram stories. Make sure to give me a follow if you’re curious to see the quality and fit of any of these items! What have you picked up so far from the NSale? Any wish list items? You might also enjoy my style isn’t Insta-worthy, but I’m sharing it anyway and five spring style purchases that I’m loving. oooh that side slit tank is SO cute! of course it’s sold out. understandable. probably for the best anyhow. Hopefully they’ll get more back in stock! I think they’re going to make for great layering pieces with cardigans, etc. I have to admit that just by glancing through I didn’t see anything that popped out at me for the sale, but I love that BP Cardigan that you have selected! I love long cardigans like that, they’re always so comfy! I thought the sale was better last year, but it definitely didn’t stop me from shopping! I’m anxiously awaiting all my boxes! I’m super excited about the Lush tee and how did I miss the side slit tanks earlier?! Off to check those out! Yes! Can’t wait to get everything to try on. 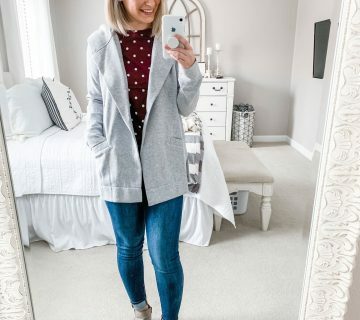 Loving the cardigan and all of the color choices it comes in! You should definitely do a try-on haul if you end up liking what you get, I feel like those are the most helpful posts because you can actually see how things look. I like everything you’ve picked out, guess I’ll have to take a look myself! Fingers crossed you find some goodies! Such a great selection!! Thanks for sharing dear! Friday can’t come soon enough for you then, I’m sure! 😉 Love the BP line.